This season- a part from checks- it's all about blinging up old items over here. (Or, if you so will, plain new ones). No such thing as too much sparkle during the festive holidays! 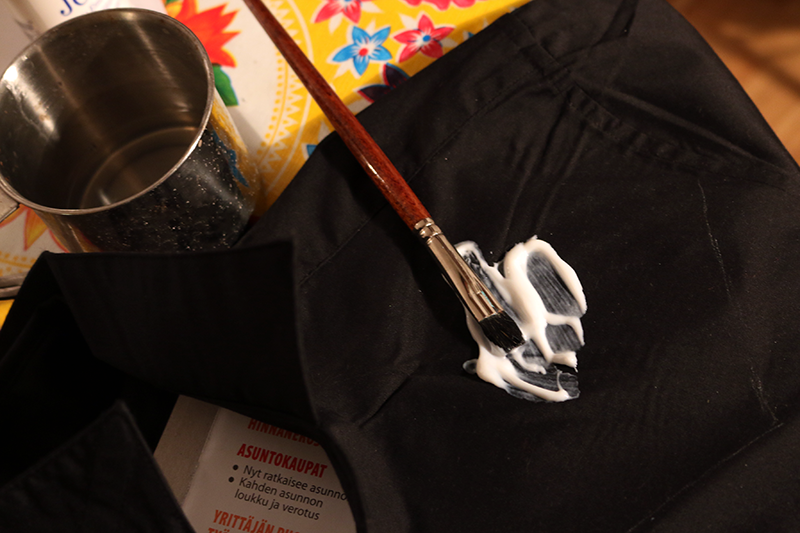 Some weeks ago it was about putting some extra bling on a pair of heels, this time we'll spice up a shirt. This shirt was originally made for a thing on stage, but since those moments would be very few and short in nature, I made it with the intention of being able to use it myself afterwards. 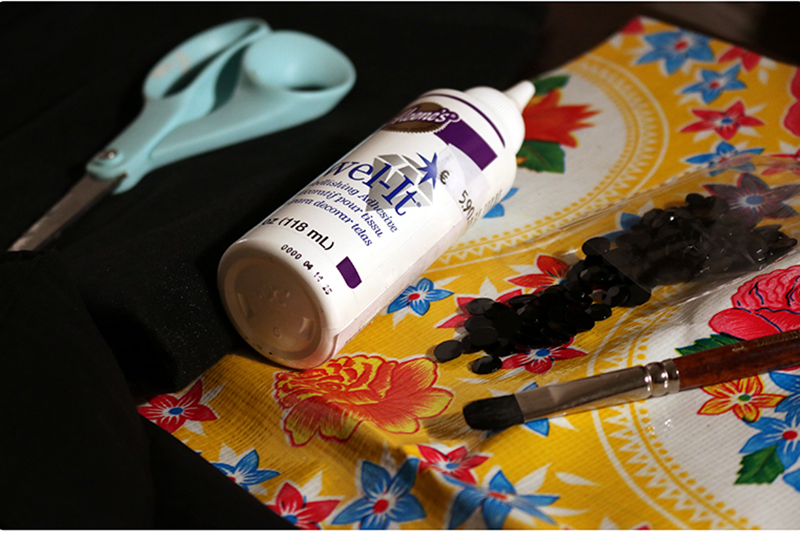 So you will need a shirt - I used a mens' slim fit shirt as I wanted it to be long - rhinestones of your choice, appliqué glue, some supporting fabric to iron underneath and a brush to apply the first layer of glue. 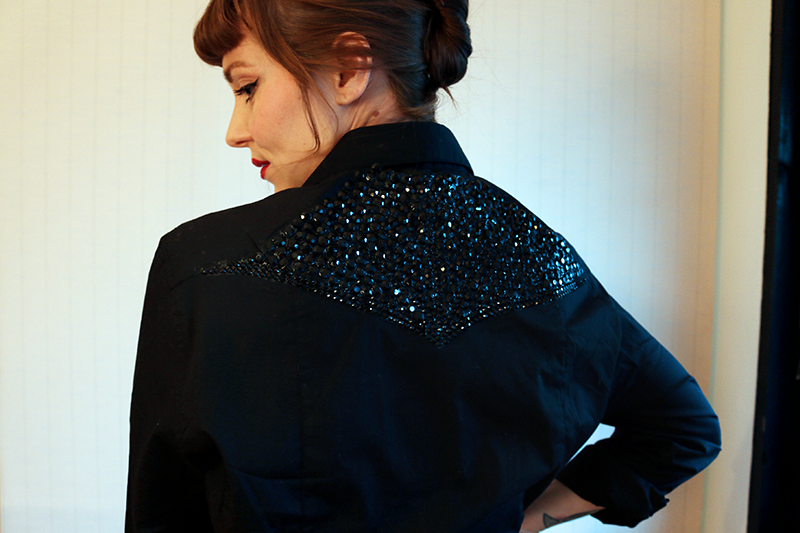 Or, needle and thread if you come across those rhinestones that can be sewn on. (And if you're patient enough to do so). 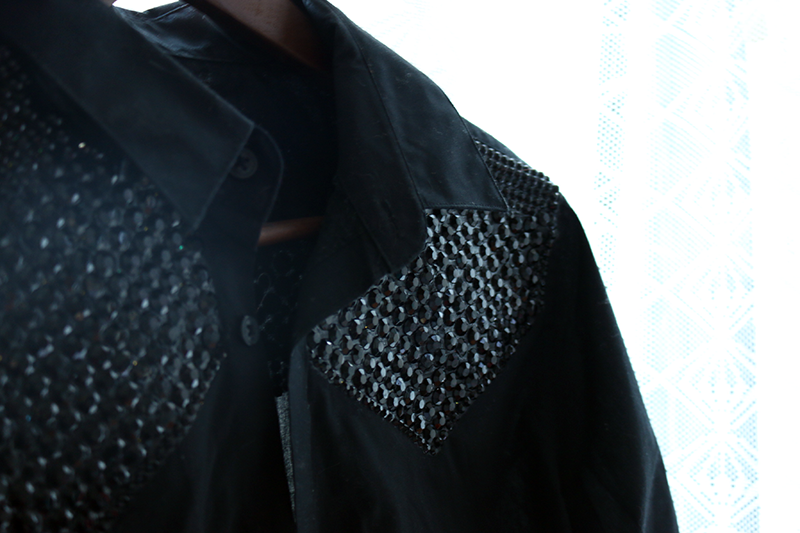 I used acrylic stones, they are lighter in weight; this shirt will need a lot of them. 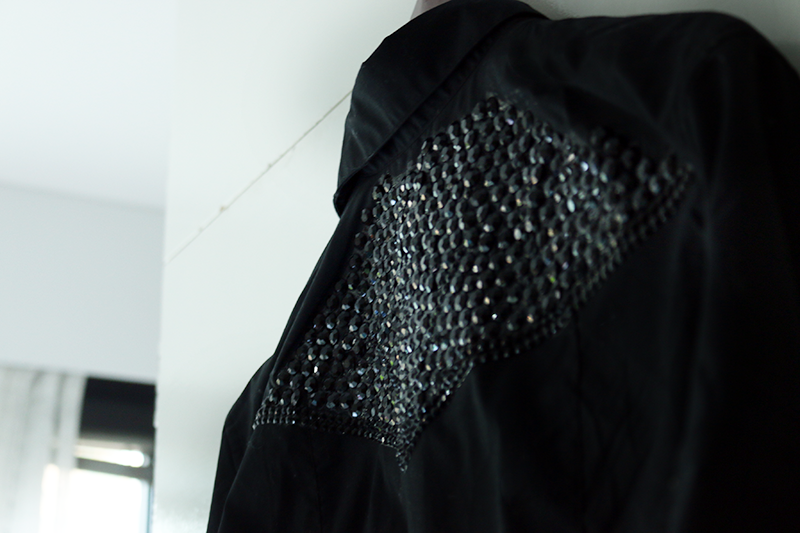 Your shirt will take 24 to 48 hours to make depending on weather you add your bling to just the front or also the back; the glue needs to dry properly before wearing. 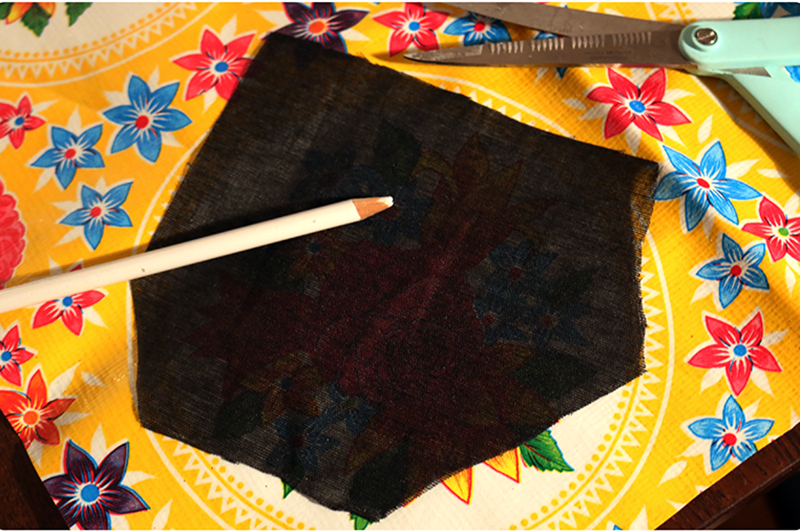 First, cut the supporting fabric in the shape of the area you want to embellish (use a piece of paper to get the shape right by trying it out on your shirt first and then transferring it to the support fabric), or a bit larger than that, and iron it in place. 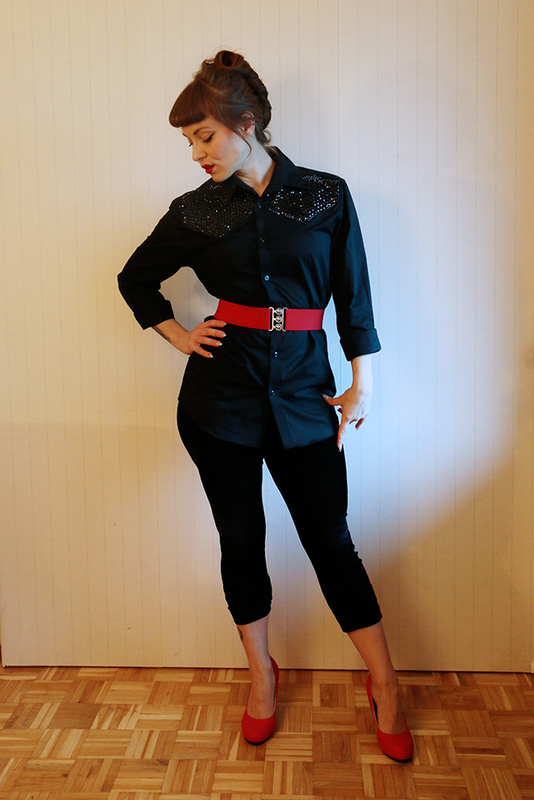 This shirt had double fabric at the back yoke so it did not require extra support. 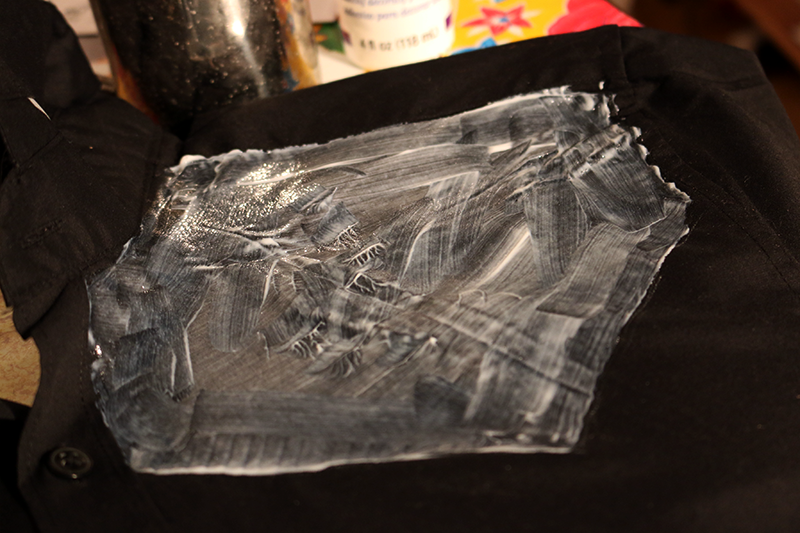 Then, working first on one side, put glue on the area to be embellished. As you can see I placed a magazine under the area I am working on so the glue won't go trough to the opposite side. 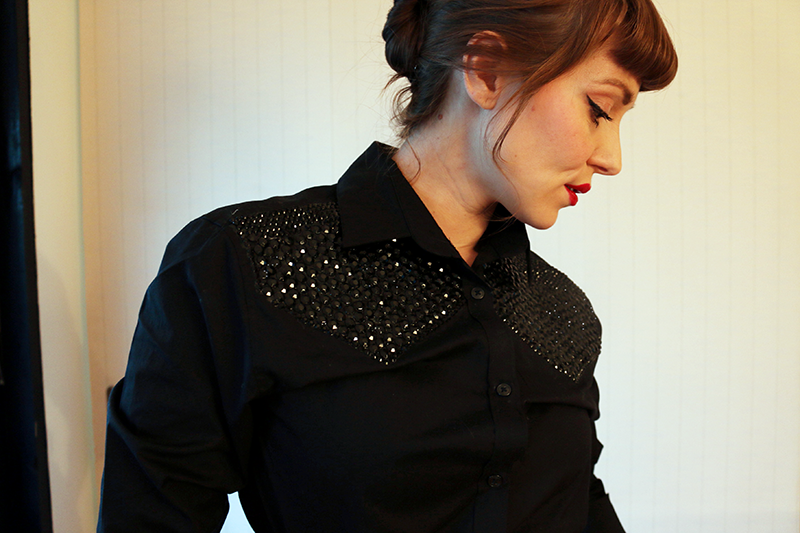 I sparkled my shirt up in a western fashion but any pattern will look good; lines or dots or, yes, lines forming...checks. Then you might want to draw them out first so they end up even and don't look like something your kid made you for father's /mother's day and that you were forced to wear. (Because, that's how it would end up for me at least.) 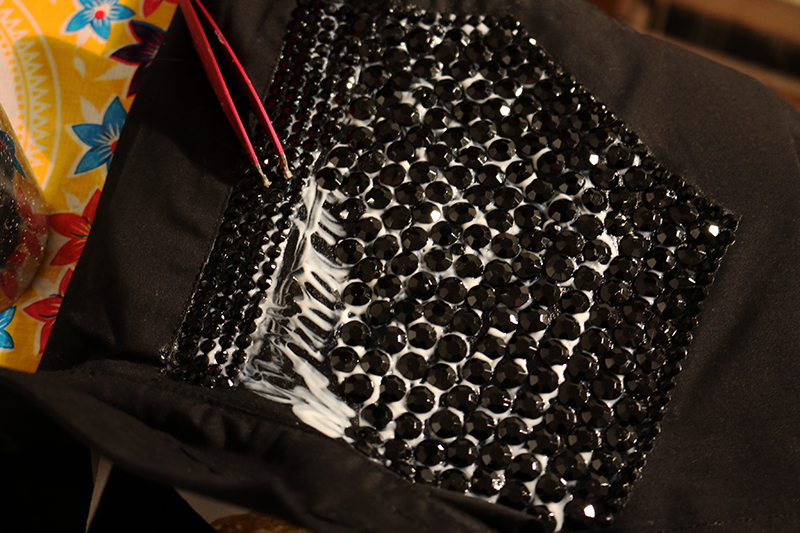 I drew along the edge of the support fabric, which I had cut into exactly the shape of the area I wanted embellished. 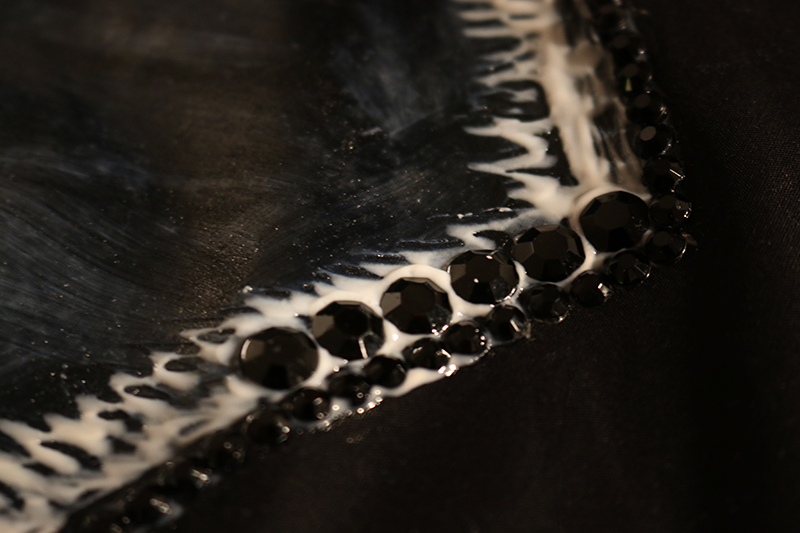 I use Jewel-it glue for almost anything of this kind, it dries slowly to be fully transparent and elastic and the items can be washed. So use that or any similar. But it will leave ugly stains if you drop it where it's not supposed to be, so be careful. The glue is best spread out with a brush - rinse the brush and put it in warm water immediately afterwards if you ever want to use it again (like, for the other side after a while). Let the glue sink in for about ten minutes and then apply some more to the section you will start with. I apply my stones with a pair of tweezers. Carefully lift the shirt a little bit every now and then so it does not stick to the surface underneath. Then on to the other side! Let the shirt dry for an hour or two laying down until the glue is no longer white and then hang it to dry over night before wearing - or before doing the back (after which you of course will have to let it dry over night again). The front of the shirt and the back the day(s) after. I did not put embellishment all the way over the shoulders because the shirt would then have turned very hard and bulky when worn. I used 700 of the bigger sized stones (200 on each side in the front, 300 in the back, bought them at 2,50€/100pcs bag) and some 400 of the smaller ones (about ten euros). Whatever you chose to make, remember you will most likely need more pieces than you'd think of at first (unless this is everyday business for you), that goes for all embellishments. 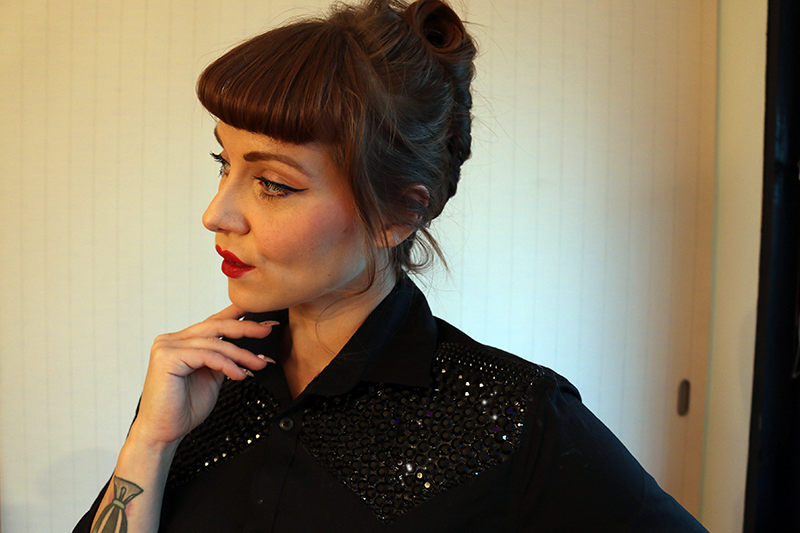 And here's me wearing my western Cash goes Liberace-shirt! This time with a pair of velvet capri leggings and red details, the next time perhaps with a pencil skirt. This is a very good and clever art work with glue. In Asian clothing these types of techniques are very useful. My goodness that looks fabulous! And when using dark colours it's not even too bling for everyday use. Thanks for the great idea! That is totally awesome! You are so clever and creative. This is a great idea for retail fashion accessories I have. make some DIY fashion blogs. It's really great. You have blown me away! Keep it up!